Les Subsistances are a heritage site with a rich history. 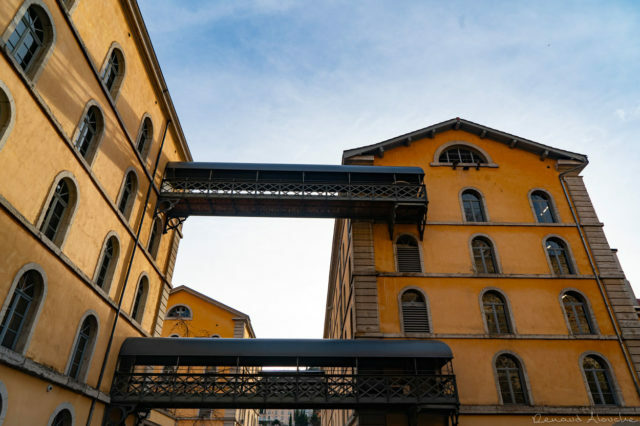 While the site’s first traces of occupation date back to the 2nd century CE (glass workshop and Gallic pink granite quarry), it is the last four centuries that have really left their mark. Since the 17th century, Les Subsistances have had three major uses: first as a convent (buildings in pink ochre), then as a military garrison (buildings in pink ochre), and since 2000, as a cultural centre. 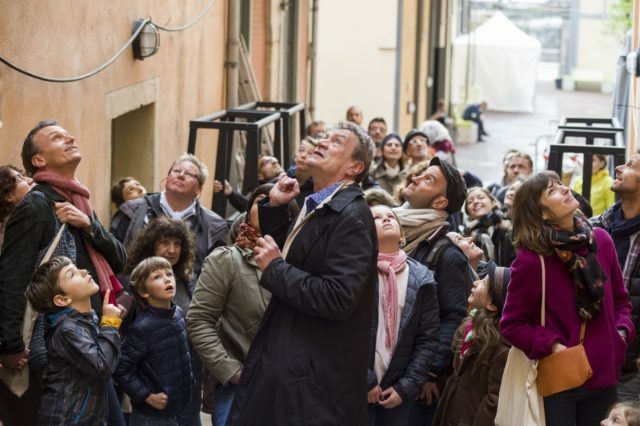 Today it combines the International Laboratory for Artistic Creation dedicated to theatre, dance, and contemporary circus, and the Ecole Nationale des Beaux-Arts de Lyon. 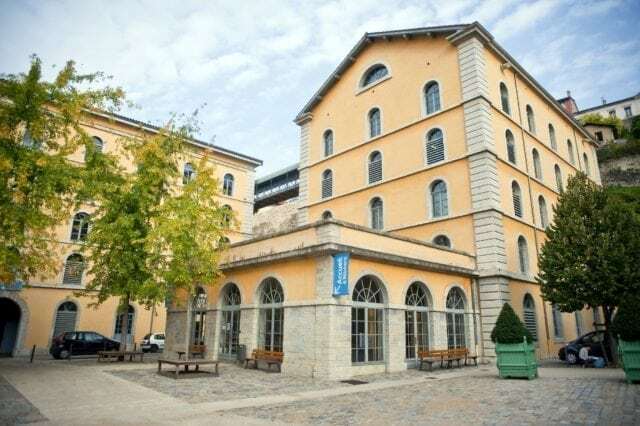 Set between the Croix-Rousse and Fourvière hills, the Serin quarter enjoys a strategic position. Easy to defend, it marks the Northern Entry into Lyon. To block access to the city at night, the guards strung a chain upstream across the Saône, and another at St-Georges to block entry from the South. The river gave rise to all sorts of fantastic tales, such as the one told for centuries about the Machecroute, a type of enormous aquatic dragon said to be responsible for the numerous floods the city suffered: a single flick of its tail caused the waters to rise. A stela at the street-side entrance to the restaurant shows the level of the 1840 flood. In 1640, the Sisters of the Visitation acquired the land and had a small cloister built where the restaurant now stands, and a church along the grillwork that today separates the site from the riverbanks. Together these formed the convent of Ste-Marie des Chaînes. Renting the vast surrounding lands and selling produce from the vines and orchards around the cloister provided the sisters a comfortable life. The convent prospered and counted up to 70 persons, most of whom were girls from wealthy families. Though the convent began to have financial difficulties in 1700, wealthy young girls continued to come in large numbers, so the mother superior, Sister Sépharique d’Honoraty, decided to have a larger convent built. Legend has it that before construction began, she announced: “to spare expenses, we will forgo an architect. I will draw up the plans myself, and may God confound us if we don’t succeed”! The new building crumbled rapidly and was rebuilt at great cost. In the end, a quarter of the project had been completed when the convent was declared national property in 1789. In 1791, after having been chased out by the Revolution and the arrival of the guillotine in Lyon, the nuns abandoned the site. In 1807, the army took over the site and used it for storage and as a settlement for the many soldiers from surrounding forts. From 1840 to 1991, the site served above all for making flour and bread, as well as for packaging coffee, tobacco and wine. In 1840, the army built the great square called Manutention Ste-Marie des Chaînes. 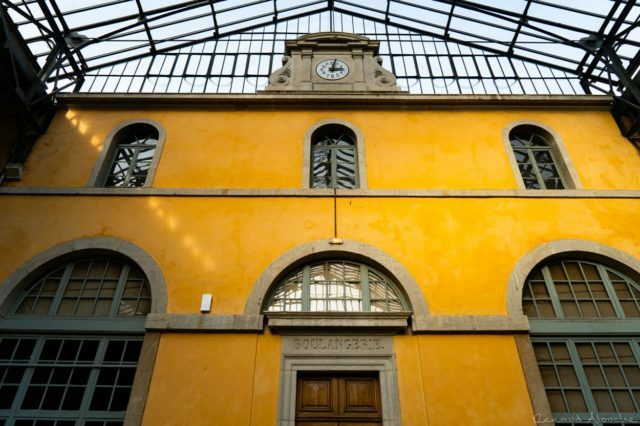 As of 1870, the 1300 m2 of central courtyard were protected by a metal skylight inspired by the Eiffel School. The first wheat mill was built in 1853 on the current site of the furnace. 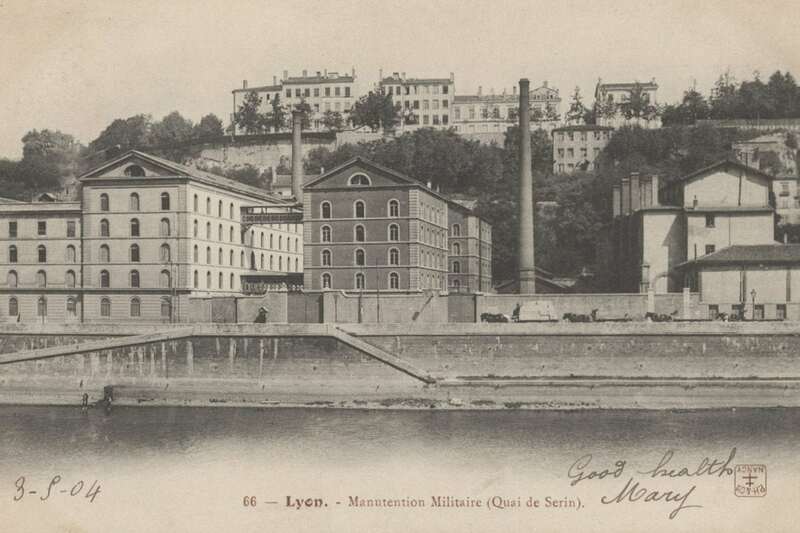 A second mill was built in 1870 (now the administrative building), and a final mill in 1890 (behind the reception). A bakery with six large coal ovens was built in one of the alleys of the Manutention, thus completing the chain of production. Thereafter, the site produced bread and packaged food rations semi-industrially, supplying the neighbouring fortifications in peacetime and the front during the great wars. The site was re-baptized “Les Subsistances militaries” in 1941, and the army occupied it until 1991. 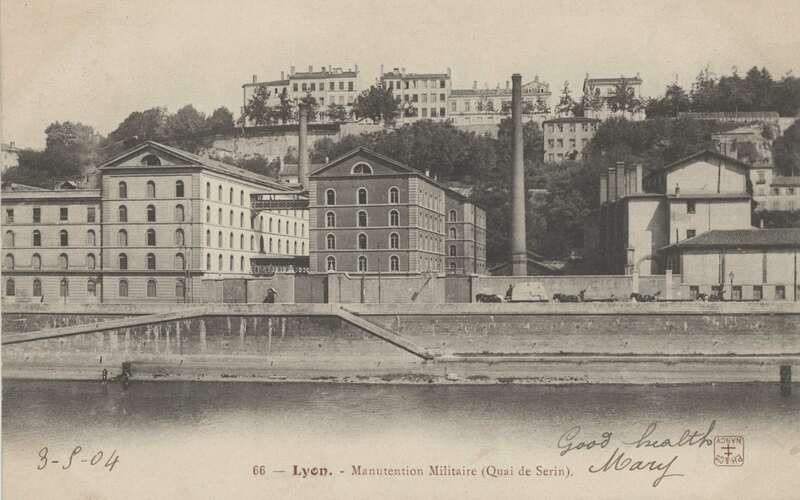 The state donated the buildings to the city of Lyon in 1995. 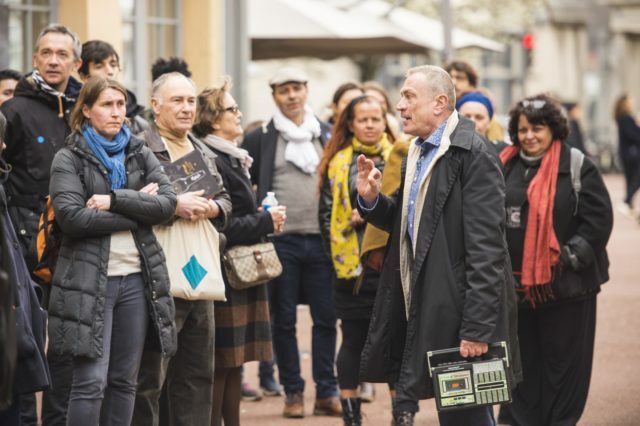 – 1998 : the Ville de Lyon dedicates the site to artistic and cultural activities. – 1998 : Paul Grémeret first imagines the project, dying on the job in 2000. – Septembre 2000 : Klaus Hersche succeeds Paul Gremeret. – January 2001 : inauguration of the site renovated by architect Denis Eyraud. – November 2003 : Guy Walter and Cathy Bouvard take over the direction of Les Subsistances. – September 2005 : 2nd phase of renovation initiated by Gérard Collomb, Senator Mayor of Lyon. Works directed by architects Michel Lassagne and William Vassal. The historic visit on your screens! Itinéraire historique et artistique des Subsistances pour smartphones et tablettes en libre accès tous les jours, toute l’année. La création d’une visite interactive appelée Subs-circuit entre dans une logique de médiation, de création et d’innovation. Cette visite pour Smartphones & tablettes conçue par le duo d’artistes multimédia Claire Glorieux & Fabrice Métais associe de l’audio, des images, des textes historiques et des montages vidéos. Les visiteurs peuvent ainsi se balader librement sur le site et découvrir en 11 points l’histoire riche et étonnante des Subsistances !